← Introducing Cirepil’s new Cachemire Hard Wax! 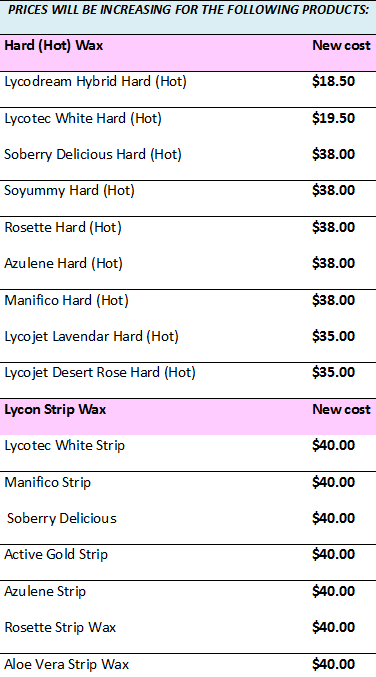 Lycon Precision Waxing has increased their prices for a select number of products. This price increase is effective May 1, 2017. Please see the Lycon product page on the Alexander’s Aesthetics website for the latest prices. Lycon continues to be very competitive when compared to other high quality wax brands and wax application is much thinner resulting in a more cost efficient wax service. Alexander’s continues to offer fast and free shipping over $200.00 or more. Please don’t hesitate to call us with any questions 800-367-2539. This entry was posted in Lycon, Lycon Waxing, News. Bookmark the permalink.